When I originally shared this post, I obviously wrote it in the summer time. But I realized that it would also make a great year-round book list for foodies so I updated the photo to make it a bit more timeless. But I’m leaving the content basically the same because it still says everything I want to and the book list is still a great one in my opinion! I’ve kept the original photo at the bottom of the post just so y’all don’t get TOO confused. Happy reading! It’s summer time, y’all! And then some! Here we are past the middle of June and for me, that means taking some time to add a few more books to my reading list because I don’t seem to make enough time during the school year to read as much as I would like. I do read throughout the year, but there’s something about summer’s more relaxed schedule that just lends itself well to reading even more books, am I right? So whether you’re hitting the road to head to the beach, mountains or even just your own backyard (or in our Texas heat, it may mean a comfy couch in the air-conditioning! 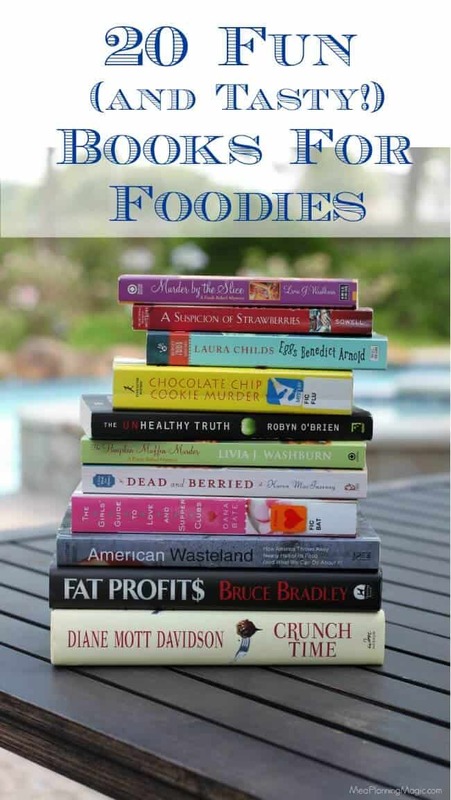 ), I’ve rounded up this list of 20 Fun (and Tasty) Books for Foodies to keep your mind entertained and your mouth watering! 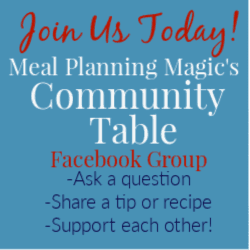 A few years ago, on the blog here, I tried to start an online book club. It just never really took off but my love and interest in fiction and non-fiction books about food and cooking has not wavered. I’ve read a few new books since the book club fizzled and they were way to fun not to share with others! So I’ve rounded up a list of books for you to curl up with this summer And while my title of this post say they’re all fun, you’ll find that some are a little more than that. Most are entertaining, a few enlightening and maybe one or two a little of both. Several of the fiction books also include recipes so that’s a bonus too! I’ve read about a third of these books already and many of the others are on my to-read list (the ones with a * are the ones I’ve already read). I like to keep track of them on my Goodreads account. You’ll find that many of the fiction books mix up some mystery in the kitchen which makes them extra fun reads (I love mysteries—and there seem to be a lot of those genre!). Several of those I have listed are the first in a series of books (as noted) so if you like the one listed here, you can find plenty more to keep you entertained. And few others (like the one by Dana Bate) have other books that are foodie related but not necessarily part of a series. There are certainly enough to keep your mind—and possibly tummies—full long after summer’s over! Hannah Sugarman seems to have it all: a great job, fancy apartment and high-achieving boyfriend in Washington, D.C.. The only problem is that none of it is at all what she wants. She wants to do what she really loves: to cook. So when her relationship falls apart, Hannah takes the leap to do what she’s always loved and launches an underground supper club. Though her success becomes the talk of the town, she hits a few snags along the way but her adventure is what makes this read so much fun! 2. 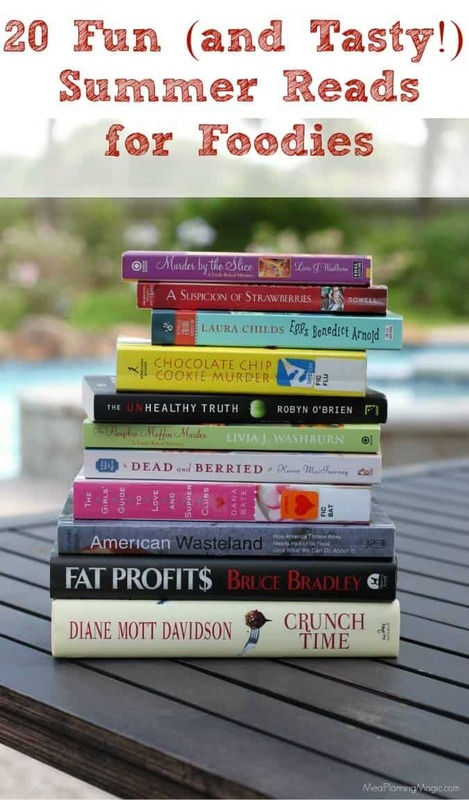 Fat Profits* I read this book a few years ago and even did a review that you can check out here. Andrew Hastings, tries to prove to his boss–and himself–that he has what it takes to launche International Food & Milling’s revolutionary, new weight-loss product. However, when a colleague’s mysterious death leads him down a trail of corporate deceit, Andrew realizes he is the latest target and he’ll do whatever it takes to uncover the truth and save his family. Author Bruce Bradley, a former food industry executive gives the reader an insider’s take on whether truth is really stranger than fiction and will keep you up at night with this page-turner! I read this book a few years ago and I loved it! So much so that it inspired me to make one of the recipes from the book, these Chocolate Covered Cherry Delight Cookies I even have Lake Eden Cookbook: Hannah Swensen’s Recipes from The Cookie Jar because I enjoy this series so much–it’s just a lot of fun! Hannah Swensen is Lake Eden’s favorite dessert-making, mystery-solving heroine that takes you on a fun ride of small town humor, gossip and murder! Hannah turns sleuth when a customer turns up dead and she’s on the case to solve the murder in her hometown making her a favorite that will have readers coming back for seconds. Colorado’s favorite caterer, Goldy Bear just wants to cook and serve up some great meals for her clients. But when her former father-in-law, gynecologist Fritz Korman, is struck down—Goldy is accused of adding poison to the menu. With the Department of Health on her heels ready to shut her down and her ex-husband trashing her name, Goldy knows she can’t wait for the police to get the job done in time. What she uncovers is more than she ever expected! Sisters, Amy and Linnie, are as different as night and day have been estranged for years. But thanks to a series of personal crises, a crafty grandmother and a national bake-off contest, the two team up with the hopes of winning some serious cash! Set up with Grandma’s top-secret apple pie recipe, how hard could it be? Living across the country from her family, Billie Breslin’s job at Delicious!, New York’s most iconic food magazine. Slowly she learns to love the town and food scene she is becoming part of. Buth when the magazine is abruptly shut down, but Billie agrees to stay on in the empty office, maintaining the hotline for reader complaints in order to pay her bills. To Billie’s surprise, the lonely job becomes the portal to a miraculous discovery. In a hidden room in the magazine’s library, Billie finds a cache of letters written during World War II by Lulu Swan, a plucky twelve-year-old, to the legendary chef James Beard. Lulu’s letters provide Billie with a richer understanding of history, and a feeling of deep connection to the young writer whose courage in the face of hardship inspires Billie to comes to terms with her fears, her big sister and her ability to open her heart to love. After an injury derails Poppy Peters’ ballet career, she changes directions and follows her grandmother’s footsteps and attends Calle Pastry Academy in a small-town Georgia. Poppy has her work cut out for her not only fitting in with Southern classmates but also proving her worth to her teachers. Her problems only get more complicated when she’s accused of stealing expensive black truffles. Her attempt to clear her name eventually results in her finding a dead body instead! For Poppy to survive she’ll need to find the missing truffles, a killer and prep for the school’s dessert competition for a coveted pastry internship in Paris. Can Poppy prove she’s got what it takes without crumbling from the pressure? When 31-year-old Wynter Morrison announces that their marriage is over, the former trophy-wife finds herself on the hunt for a job–which she discovers is a lot more difficult than she realized. Thanks her time as an exchange student in France, she falls back on her skills as a breadmaker and lands a job a local bakery. Along the way, she meets the eclectic women that frequent the bakery and discovers that baking bread provides a wonderful healing power and helps her learn about where she’s come and how far she can go. When the corpse of a no-good local turns up underneath a car in a local garage, Phyllis puts on her sleuthing cap to solve the mystery. But even solving the crime won’t distract her from out-baking her rivals and winning the contest by knocking ’em dead with her unusual Spicy Peach Cobbler. But when a contest judge dies, she’s the newest murder suspect and she must do what she needs to to clear her name. When Mala and Ronak learn that their mother has only a few months to live, they are reluctantly pulled back into the Midwestern world of their Indian immigrant parents. But in that time, Mala commits to mastering her mother’s slow art of Indian cooking. The time together allows the two to not only work together but to talk about their past and their failures. At the same time, Ronak hits upon the idea of selling their cooking-as-healing experience as a high-concept memoir, immigrant and native-born must find a way to cross this last divide. Trading in Texas heat for Maine’s tangy salt air, Natalie Barnes risked it all to buy the Gray Whale Inn, a quaint bed and breakfast on Cranberry Island. She adores whipping up buttery muffins and other rich breakfast treats for her guests until Bernard Katz checks in. The overbearing land developer plans to build a resort next door where an endangered colony of black-chinned terns is nesting. Worried about the birds, the inevitable transformation of the sleepy fishing community, and her livelihood, Natalie takes a public stand against the project. But the town board sides with Katz. Just when it seems like things can’t get any worse, Natalie finds Katz dead. Now the police and much of the town think she’s guilty. Can Natalie track down the true killer before she’s hauled off to jail…or becomes the next victim? When a man is poisoned by tea, Theodosia Browning, owner of the Indigo Tea Shop, is the prime suspect. To prove her innocence, she must track down the real killer before someone else takes another fatal sip. Suzanne, Toni, and Petra open their cozy cafe, the Cackleberry Club after they lose their husbands. But the cafe becomes a crime scenewhen a lawyer dies with a secret on his lips and egg on his face. Suzanne must prove that she’s not involved and shed the light on the truth. Displaced from their native India, Hassan’s family settles in a quaint village in the south of France. They plan to open an Indian restaurant–that is, until Madame Mallory, the owner of a classical French restaurant, gets wind of it. Her icy protests against the new Indian restaurant so near her own escalate to all out war; until Hassan’s cooking talent and love for Mme. Mallory’s assistant, Marguerite, cannot be ignored. Becca Robins leads a simple life, making jams and preserves on her very own farm. But when there’s a murder in her quaint little town, she puts herself in the line of fire to defend her friend’s innocence-and goes from making jam to being in one. Disclaimer: We are a participant in the Amazon Services LLC Associates Program, an affiliate advertising program designed to provide a means for us to earn fees by linking to Amazon.com and affiliated sites. This means that I will receive a small percentage of the sale as a thank you for the referral but AT NOT EXTRA COST TO YOU. Thanks for your support! Gah! I love books like this and never seem to find time to read. But I’m definitely putting these on my reading list and hope they are available on Kindle! Thanks for the reads. I’m super excited! So glad you liked the list Kristi! Like you, I don’t take as much time to read as I would like but every time I pick up a book like one of these I ask myself why don’t I? I think most of them are available on Kindle too!